We want to put blockchain in context as many people find the technology quite confusing. 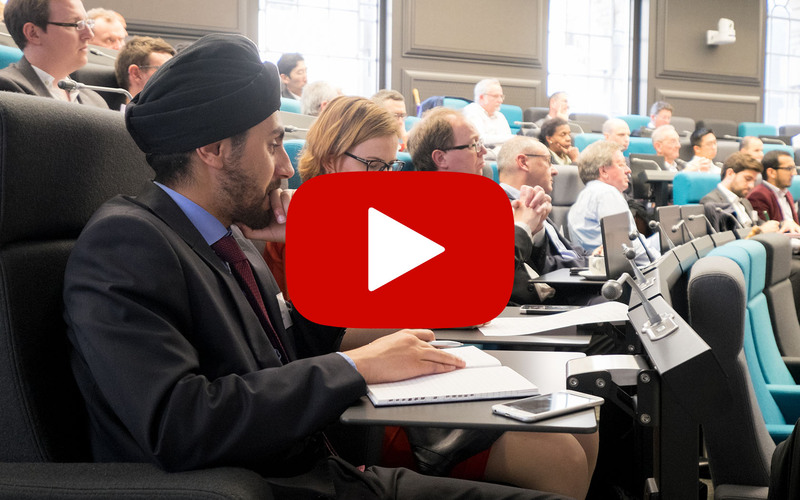 Therefore we decided to explore some of the fundamental principles, ideas and concepts around blockchain and raised key questions that we believe the profession should consider. 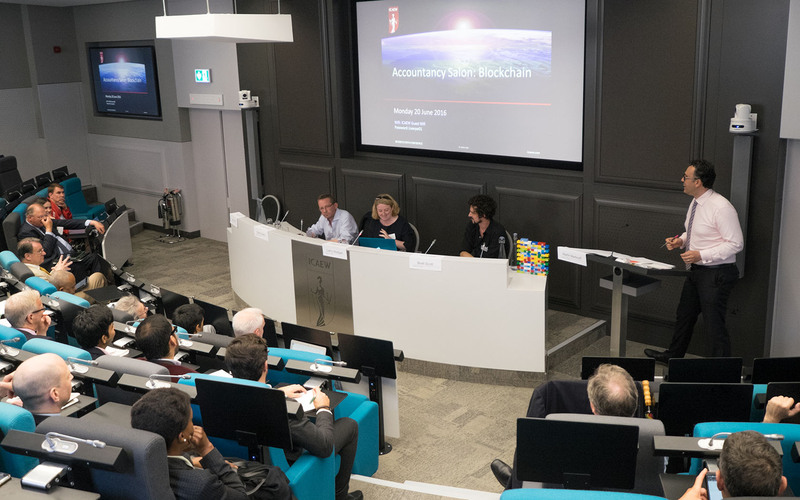 A report from the Accountancy Salon on blockchain: an open discussion on the impact of this technology on the profession and opportunities for our members. Many people think that bitcoin was the ‘dark early ages of blockchain’ but in fact, it is still being used and has attributes and capabilities of most blockchain systems. Bitcoin was originally thought to be digital cash. This is highly misleading way of thinking about it. The essential thing about bitcoin was to do find a decentralised way of doing what a central bank does around electronic payment systems. So, bitcoin was not a digital version of cash, it was a decentralised version of digital transactions. If we look at how the global bank systems work, we can see that private banks create databases in response to the messages that people send them. To move money around the system, you send a message to your bank – you ask them to create an account entry for you and then there is an elaborate process to reflect the change in their database. The essential feature of the banking system is that you have almost an oligopoly – a relatively small group of private banks, control the databases that you interact with. This how the existing digital currency ecosystem works. The essential feature of bitcoin was to try to do that without the private banks. What bitcoin did was it replaced the private databases of the banks with a public database and allowed a much wider range of people to alter this database. So if the banking system is a private database, altered by a small number of intermediaries, the bitcoin is a public database, open to a wide range of people, who collectively, keep the accountability of the system. Because of this feature, many groups became very excited about bitcoin – from tech geeks, to conservative libertarians, to people concerned about the stability of the financial system. The first internal battle or skirmish was when some people decided they want an alternative form of bitcoin. Like Dogecoin, which was introduced as ‘fun currency’, it reached at one point a capitalisation of over $60 million. So some of the initial skirmishes were around the alleged advantages of each of those alternative currencies. At some point people started thinking – if we have this decentralised way of electronic money transactions, could we use the same underlying system to record things other that currency transactions? This is how the ideas for blockchain 2.0 emerged. One of the interesting incarnations of this was Ethereum. An anthropologist might find the language of bitcoin and Ethereum teams are quite different even in their language. Bitcoin has this language about battle, metallic, aggressive fight against the financial system. Ethereum has this sophisticated, silicon valley dynamic networked imagery about collaboration. Both use the same underlying technology. This is when some of the corporate interests became more apparent in developing more flexible and close systems. This has created another fork in the blockchain community. The Ethereum system is open and anyone can use it. Most of the interests of the financial services industry comes from ideas about taking this existing technology to improve the existing infrastructure. Philosophically, this is quite different from the original reason why blockchain was created. Bitcoin is permissionless system and everyone can join without any identification. Therefore, verification of transactions takes a very secure cryptographic approach. Permissioned systems on the other hand – like Rolls-Royce’s supply chain system – has very high bar of identity and low verification on transactions. More research and thinking is needed in the area of digital identity. In May 2016, at the annual summit of ID2020, following the UN Global Goals, a large group of humanitarian organisations and technologist discussed how to bring legal and digital identity to 1.5 billion people. There is a global desire to embrace technologies like blockchain from a pure humanitarian perspective. Another evolving aspect of blockchain is its language. At its basic form, blockchain is distributed or decentralised or shared. These terms are quite similar but at the same time they are quite fiercely debated on forums. Basically, they mean non-centralised or without a central authority. We also have digital or crypto, referring to the digital or cryptographic algorithms involved. People also use the words ledger or database. Thus we have ‘different’ versions of ‘distributed digital ledger’ or ‘shared crypto- database’. These variances of language come with their full debates about the technicalities of the words. The original justification for developing such system had quite a political edge to it. Essentially, there was a critique around centralisation, which could be found in both conservative libertarian communities (who believe that markets should be complete free and there should no interventions in how markets operate) but also left-wing anarchists who believe that centralisation degrade humanity. The question that was how do we create a system to combat this centralisation in society, using blockchain. Anti-centralisation is common among left-wing, libertarians and pro-market groups. Yet, in places with weak institutional settings or non-existent central systems, people were asking the questions whether we can use these technologies to help. In war zones for example, where there is a collapse of centralised system, could we use these technologies to provide basic services. A lot of international development agencies are interest in this. Could this could help in areas with humanitarian disasters? The third wave of justifications for blockchain was around efficiency. This is where most of the closed or proprietary systems are focusing – how to maximise profits by improving the efficiency of existing systems. Projects like R3 and Everledger are about optimising profits. The original language of bitcoin was about resilience – it is very questionable whether you can combine resilience and efficiency. Efficiency often means centralising things, resilience means decentralising. So one of the main questions we need to be asking is what are the right justifications for having blockchain. No regulator wants to regulate technology. Instead, regulators want to ensure that legislation is met effectively by technology. If technology allows any institutions – whether it is pharmaceutical or financial services companies – to meet the legislation, and do so in a efficient manner – regulators will be absolutely delighted. In terms of governance, most people are sceptical of the ‘crypto-anarchy’ view that distributed systems will allow you to remove governance. In the bitcoin/blockchain example, it allows you to remove the middle man from transactions but it does not imply the removal of governance. These are two separate things and we can see this in the blockchain community today – people have consensus around transactions but cannot agree on the size of the block. Something very important to take into account when we talk about these technologies is that they still interact with people and people can still disagree with each other. Perhaps we don’t need standardisation for this type of technologies as the protocol used is itself a standard. What might be needed is standardisation around the implementation in certain industries. Would pharmaceutical industry be the first to adopt? There is a new legislation coming to pharmaceutical industry in Europe mandating that every single pack of pills would need to have a barcode on it. That barcode has to be registered with a central European regulator. So every single pharmaceutical company in Europe will have to introduce technological change in the next two years. Another big issue in the industry is the counterfeit drugs. A great challenge for most ‘solutions’ that ‘put things on the blockchain’ is that they are not really blockchains (in the sense of decentralised trustless systems). Most of these solutions could easily be provided by more secure central databases. LinkedIn is a good example – you create a profile, add your credentials and share your record with the rest of the world. We can easily imagine a scenario where LinkedIn adds more verification and security and thus becoming a recognised central authority on legitimacy of information. All this is not a blockchain per se. What are the problems that blockchain might be able to solve? Imagine a situation where there are 100 or 1000 people who all need to keep the same account of reality. This would prove to be technologically extremely difficult. So most blockchain solutions start with the technicality of the question: how do you reach a consensus? However, the second and more important question is what can you do once you have this system in place? You could do very trivial things like certifying university diplomas. What is so profound in the ability to achieve consensus? This is the question that led to the development of different visions for blockchain. One of them is the political vision: we could use this process to avoid having central institutions (which are prone to corruption and manipulation) to coordinate activities. The second argument is that maybe it is faster or cheaper. What is a blockchain enabled world? If we take the example of pharmaceuticals. Today, if we need to audit a company, we go in and ask for every single work order, purchase order, invoice, receipts or information for all transactions on let’s say 23 February last year. Someone then has to go away to collect all the piece of paper. Similarly, someone else in Europe and US has to do the same. They all need to copy, scan or fax copies to the auditors. Auditors might need to ask to verify all this, check for phone records, etc. In a blockchain enabled world, you won’t have to do this as all the information about transactions from 23 February will be stored on a trusted immutable ledger. You could even go for real-time auditing, real-time accounting, real-time tax collecting. All this is a long way from today but the new products and systems will need a lot of assurance. Boards need to be assured that any new technology that will be implemented will deliver. Why is blockchain cheaper and (potentially) easier to use? Perhaps the main reason is that it is open source technology. Because there are no IPs involved and no rent-seeking from developers, organisations and industries can easily develop their own platforms and systems. We can think about blockchain like the HTML of the internet. Another reason is that it is immutable. Blockchain does not have a single point of failure, compared to the other systems that we hear about on a regular basis. The list of companies and databases being hacked grows constantly. Why is this interesting for accountancy and audit? One of the predominant perspectives is that this will disrupt the accounting industry. If we have shared account of reality, if we have these shared databases to keep account of things, we shouldn’t need these intermediary parties and validators to check things for us. 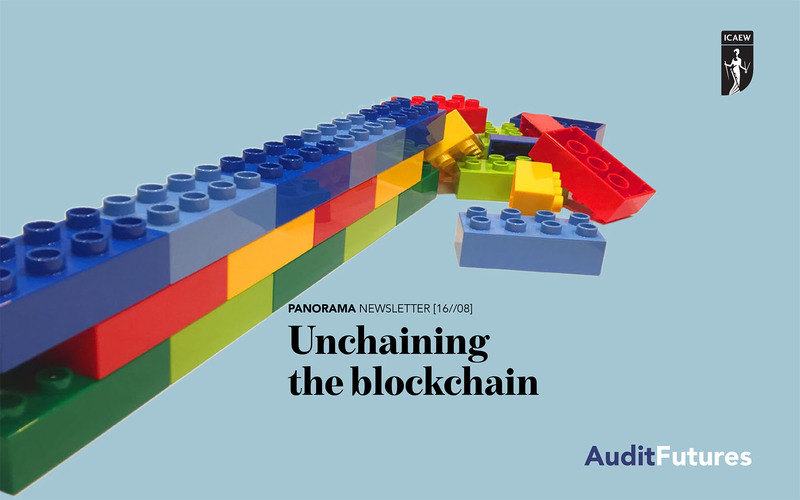 So, would blockchain disrupt the trusted intermediaries of auditors and accountants? A second perspective is about the new opportunities that blockchain could open to the profession to offer new services to their clients. Internally, blockchain could offer efficiency improvements for the profession, like a cost-cutting measurement. The most interesting perspective is when we think more broadly about these open-source projects. Is there a role for the profession to maintain public trust in open systems? The Ethereum hack of June 2016 created a huge turmoil in that community. One of the early reflections was that it is an open system which did not have a proper close inspection (audit). Is there a role for the audit profession to maintain trust in such systems? One of the biggest implications for the accountancy profession is that auditors would need to learn how to read code. We have seen the need for this with the governance issues around Etherium, when an ability of the system was exploited. Also, there will be need for assurance around companies and sectors implementing any blockchain solutions. Boards will require assurance that blockchains are designed and coded as resilient and cyber-secure. What type of assurance services might be needed? If we think about the blockchain technology as a box, we would need assurance on the technology that is in the box. Perhaps once or twice a year. Then, we would need assurance on who has what rights to access the information. For example, regulators would need access to read but not modify records, auditors would need special rights too. Tax authorities would have permissions to access certain transactions. So assurance on the set of permissions and identities would be needed. How do we train people to think long-term? Especially, people in tech world who are focused on short-term results. Another key question is whether these new systems still relying on the existing systems? If so, they are just adding layers of intermediaries.